the mechanics once the tank has been removed. Conceived as a supersports bike, the FJ has mellowed over the years. Outgunned on sheer performance by the younger generation of motorcycles, the FJ has become a standard of reference for grand touring bikes. This four-cylinder superbike with its great reserves of torque was upgraded from 1100cc to 1200 cc in 1986. New flexible mountings for the engine, adopted in 1981, have isolated the rider from vibration, while the upper part of the fairing, more generously proportioned and fitted with a taller, carefully profiled windshield, cuts down wind eddies. Seven years after its launch, the evergreen FJ took a major step forward with the adoption of ABS. 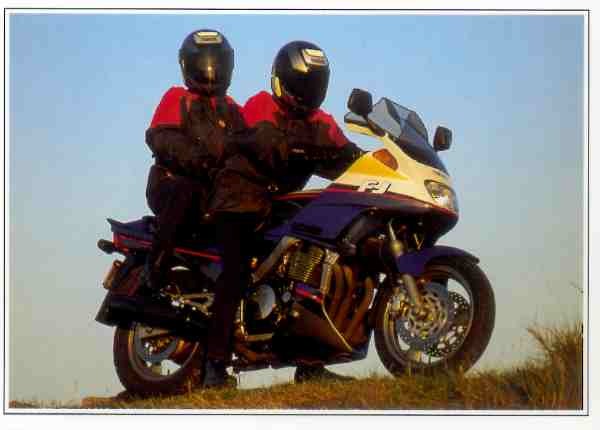 While BMW had paved the way in 1988 by introducing the first series production bike with electronically controlled anti-lock brakes, Yamaha's ABS system, with a further three years of development behind it, was particularly sweet in operation. The anti-lock braking system fitted to the Fj 1200 gives a high level of security by enabling the rider to brake no matter what the conditions are beneath his wheels.